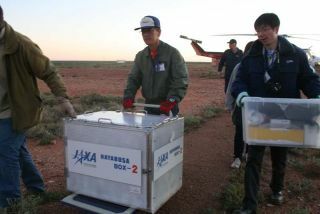 The sample return capsule (inside a box) from Japan's Hayabusa asteroid probe is transported by helicopter to the Instrumentation Building inside the Woomera Test Range after its June 13, 2010 landing. The re-entry capsule was housed in a temporary clean room before being returned to Japan on Tuesday. Full Story. This story was updated at 4:38 p.m. ET. The triumphant Sunday landing of a Japanese space capsulethat visited an asteroid and returned to Earth despite near-overwhelming?malfunctions now has scientists around the world asking one final question: Didit actually capture a piece of asteroid Itokawa? "First, the sample container will be inspected, andthen the content will be extracted," said Keiji Tachikawa, president ofJapan's space agency JAXA, in a Monday statement.? "We hope to find theItokawa's surface material in the capsule, and contribute to understanding theorigin and evolution of the solar system." ?The spacecraft's sample return capsule, which separated asplanned three hours before re-entry, appeared as a bright light leading themain fireball created by the demise of its mother ship. The dazzling spectacle was a fiery finale for the Hayabusaprobe, but just the beginning for scientists on Earth.? Hayabusa's sample return capsule, a 16-inch (40-cm)container about the size of a basketball, survived re-entry using a heat shieldand successfully parachuted to the Earth's surface. It has since been recoveredby JAXA scientists.? But it is unclear if Hayabusa's sample capsule actuallycontains traces of the asteroid Itokawa. "The hope is that there will be at least some dustparticles inside the space capsule," Don Yeomans, the U.S. projectscientist for the Hayabusa mission, told SPACE.com. Japan launched the $200 million Hayabusa mission in 2003 andit reached the silicon-rich asteroidItokawa in 2005, where it landed multiple times in attempts to capture samples.But the probe's projectile device designed to kick up samples so they could becollected failed to work properly. Yeomans said that scientists know Hayabusa's target asteroidItokawa is a silicone-rich space rock with the consistency of arubble pile. But actual samples, however small, will give researchers concreteevidence of the fundamental characteristics for such asteroids. "Even if only a couple of particles muchsmaller than a grain of sand were collected, we would be able to get moreinformation," Yeomans said. For now, scientists will have to wait until the Hayabusasample capsule makes one last journey from the Australian outback to JAXA'sSagamihara Campus in Kanagawa, Japan. Only then will the capsule be opened in aclean room to reveal, once and for all, if it captured the first-ever sample ofan asteroid. In addition to its asteroid mission, Hayabusa has alsoalready contributed to a different branch of space science. An international team caught the spacecraft's re-entry onvideo from a NASA chase plane as part of an experiment to study how spacecraftheat shields perform during re-entry. Hayabusa's heat shield, too, was laterrecovered. "It was incredibly fortuitous to see the capsule andbus so well separated. We got data on both phenomena," said PeterJenniskens, who led a NASA-sponsored observation campaign and is a researcherfrom the SETI Institute in Mountain View, Calif. "For years to come, this video will serve as a demonstration of why we build thermalprotection systems, as it shows the capsule surviving the entry and the unprotected rest of thespacecraft being torn apart bythermal and mechanical stresses." SPACE.com's Space Insider ColumnistLeonard David contributed to this report from Golden, Colo.